I find it funny that of the multiple bodies of water that the Ole Man River Half Marathon and 5K touches, none of them are the Mighty Mississippi. However, the H20 that concerned me most leading up to this past Saturday’s race didn’t come in the form of a lake or bayou, but instead from above. 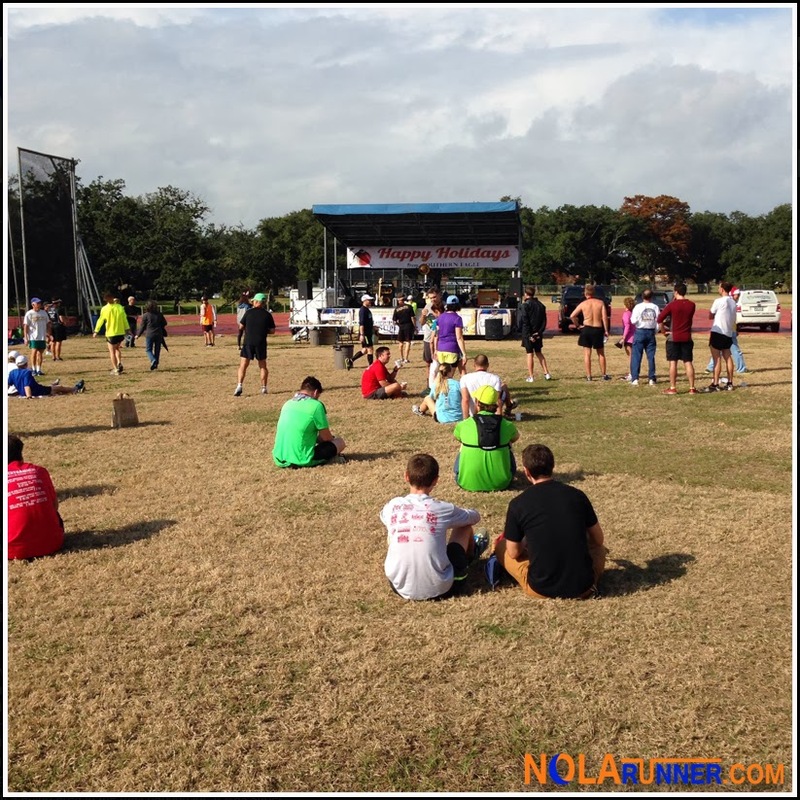 The thirty second running of the Ole Man River Half faced a forecast that included a 70% chance of rain leading up to the starting gun, but The New Orleans Track Club posted on its social media platforms that the race would go on as planned in City Park. As a result, I prepared myself for my third distance race in as many weeks. Race organizers offered early packet pickup at Southern Runner on Magazine Street the Wednesday and Thursday prior to race day. I found myself flying down River Road on Thursday evening in an attempt to make it before the 8pm closing time on Thursday evening. I caught the volunteers just before they shut the operation down, snagged my number and the long sleeved soft cotton participant shirt, thus avoiding the race morning rush. I met up with fellow runners Jenny and Stephen soon after arriving on-site Saturday. The pre-race weather was warm and humid, especially considering the temperatures in NOLA hadn’t risen above 60 for the entire week prior. The skies were ominous, as a front was clearly trying to pass through the Crescent City. The race started on time with damp streets, but no rain falling from the skies. I decided to run this race on my own, seeing what pace I would be able to keep for a half. The two weeks prior I had run races both at full marathon pace, with one weekend deciding to only do a half and the other following through with a full marathon. I realized early on that my subsequent weeks at distance racing had taken a toll on my legs. I could tell they were tight from the moment I pushed the start button on my Garmin, and they never loosened up. The course for the race winds briefly through City Park, spills out on to the shores of Bayou St. John and hugs the banks of the waterway as it winds north to Lake Pontchartrain. We hit the first water station two miles in to the race, with subsequent aid available roughly every two miles throughout. Once at Lake Pontchartrain, runners take a right for an out and back in one direction and then execute an out and back in the other direction before return trip to the park and finish line. There was a brief shower in the middle of the run, just enough to dampen runners as they were reaching the lake. The course is relatively flat, but does have one overpass that is traversed twice. It also has one train trestle underpass that dips the course early and again late in the race. These are the extent of what hill training in New Orleans is comprised of, so it’s not uncommon to hear grumbles from local runners who aren’t used to any inclines. I finished my race slightly slower than my previous half (and the first half of my full), which was a little disheartening. My tired legs just wouldn’t let me push the pace. Other runners had great days, including Jenny who PR’ed by more than two minutes! The post race festivities featured a live band, plenty of pizza and bagels, and a ceremony that awarded cool trophies and holiday ornaments to overall and age group winners in both the half marathon and 5K. 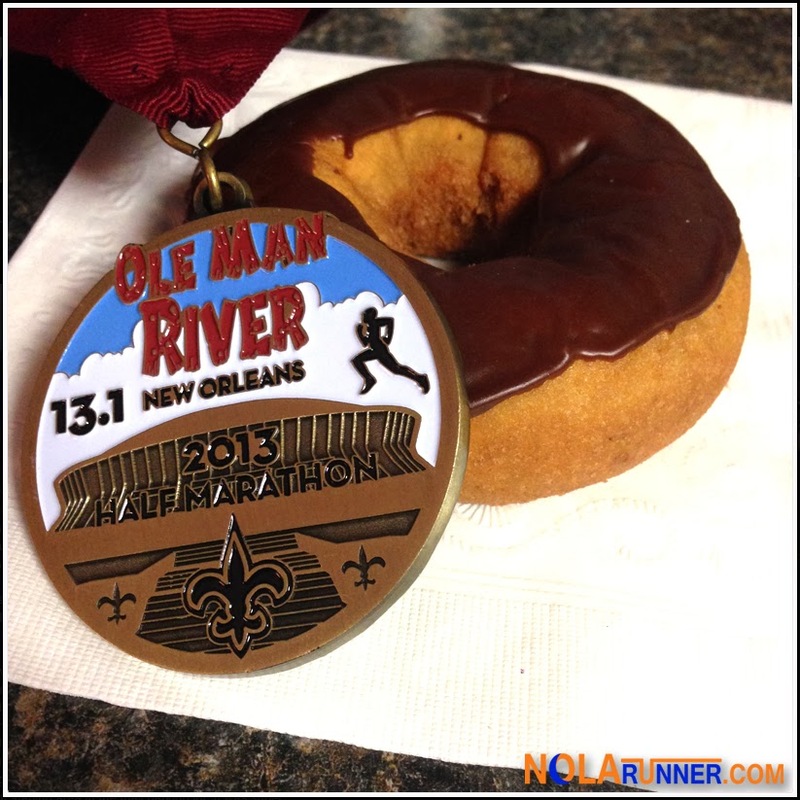 My reward was the medal presented to each finisher in the half, and a craving for a donut. The latter was satisfied soon after leaving the race site. 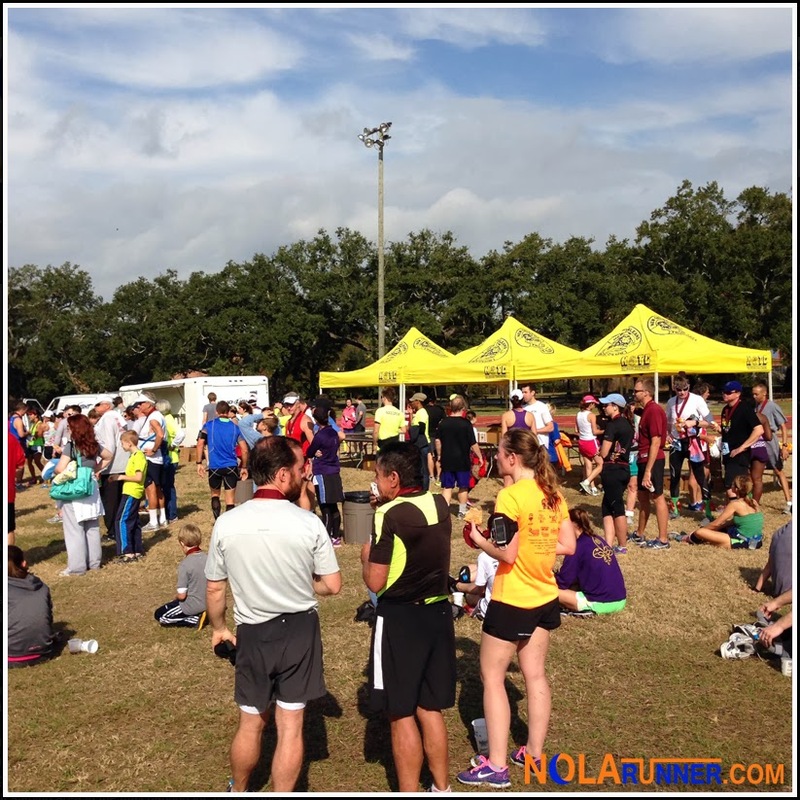 Once again, the New Orleans Track Club did a great job putting on one of their signature events. My only recollection from the day was that I personally could have used one more water station on-course, making fluids available every mile and a half. It was a humid day that was warmer than I expected. I will say though, that the stations that were on-course were very well manned with great volunteers. The two middle stations were even equipped with PowerBar gels for runners who needed a carb-induced boost. I thought that was a nice touch. 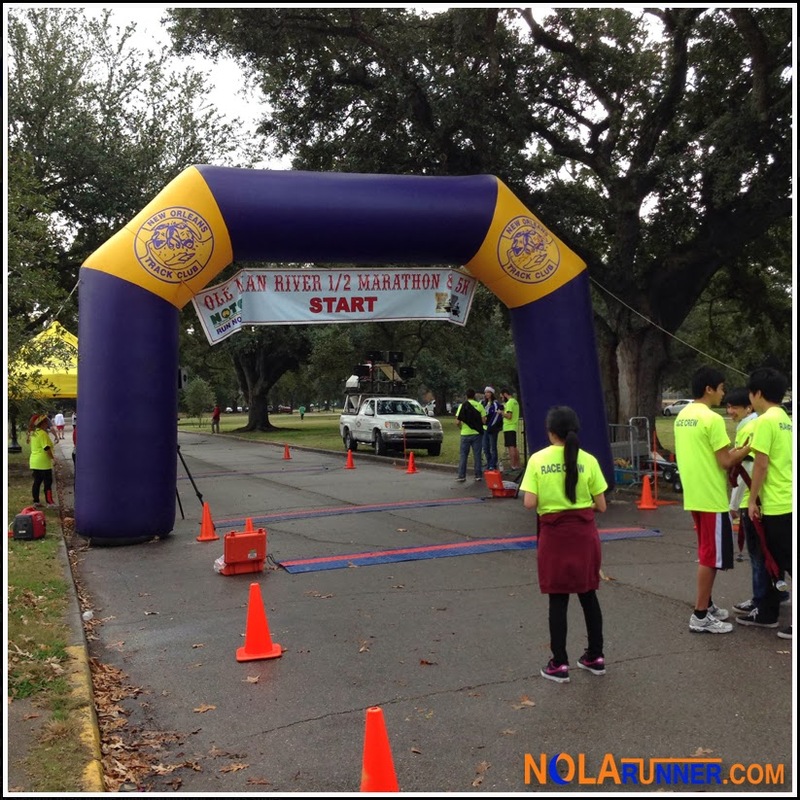 The Ole Man River Half Marathon and 5K is another one of those events in the New Orleans running community that is steeped in history. Runners remember when they ran it based on what course was used at the time, what friends they ran with, and what local athlete won the race. I’ve been fortunate to run the past six races, seeing marked improvements to the organization and execution over the years. The talent the race draws has also improved, as has the number of participants. Much like the Ole Man River feeds the economic growth of New Orleans, the race that uses its name feeds the running community and its success in the Crescent City. For complete 2013 races results, click HERE. 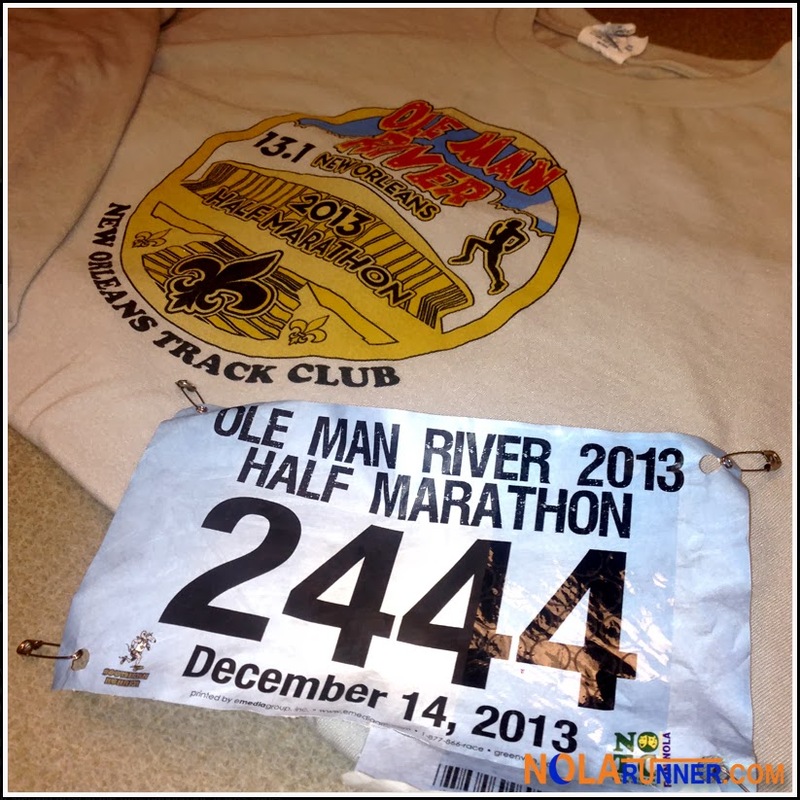 Registration for the 2014 Ole Man River Half & 5K is now available on the New Orleans Track Club website HERE. Another great race and recap for you. You should be proud of all the racing you've been doing lately, and I know you're setting yourself up for a good 2014. Congrats again! Thanks Katherine! 2014 has to be the year for some new PR's. I'm feeling it! Great summary. It was great taking a break from the snow in NY State and join your race! I had a great time! Glad you had a chance to enjoy some warm Southern Hospitality at the run! Hope you have a chance to come back for another event soon.